If you want to know how the new iPad stands up to abuse…or even if you’re secretly beginning to hate the new iPad from all the media coverage of the last several days, boy do we have the video for you! The team at SquareTrade, who has been breaking things on video for some time now, put all 3,145,728 pixels through their short regiment of drop torture-testing. We won’t tell you which iPad does better, but let's just say it’s not a happy ending for either generation of iSlate. Be warned: if you already picked up a new iPad the video may induce involuntary shuddering. SquareTrade doesn’t do their drop tests out of some perverse hatred for mobile technology – they are an insurance company for gadgets and is offering – you guessed it – a battalion of various insurance plans for the new iPad models. If you decide to get a warranty, we recommend you shop around – not only does SquareTrade offer several plans, but Apple does too (if you purchase your device through an Apple store). Network carriers, big box retail outlets, and several others are also be happy to hook you on one of their insurance plans, so do yourself a favor and do your comparison shopping homework ahead of time if you plan to purchase protection along with your iTablet. And finally, we strongly encourage you not to try and duplicate SquareTrade’s drop test. Please! Not surprising seeing as apples products are known for their easy shattering design. the iphone 4 and 4$ shatter from falls less than waist height. I have a iphone 4 and have a case on it slim one at that. I drop it all the time not a scratch. My Coworkers iPhone 4s slid off of a countertops and fell about 1.2 meters. It was in a $40 case we sell. It hit the ground and both the front and back of the iPhone were trashed. Still in the case. Gorilla glass my @$$. I've dropped my g2x 2 meters and only scuffed the corners. you drop it with a case on and you consider your phone coming out scratchless as an achievement? because that air pocket between the case and the device does provide air cushion, no matter how small it is.. and better if the case is plastic, since plastic absorbs more impact force.. so your case can be at best dismissed.. try that with the case off.. and then we'll have a case..
Can't wait to try this with my neighbor's new ipad! at least they could have invested in tougher screens with all that money rather than pumping up their stocks. 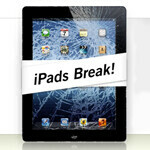 This video is useless as, we all know how easily iPads can shatter into billions of microscopic dust particles. What we would like to see is it's absorbency compared to traditional KoTeX™; is there still leakage? It's a company. And specifically a company that sells insurance for iPads and other mobile devices. If they get several hundred thousand hits...$500 is a pretty cheap advertisement. exactly, that video probably just scared a few thousand people into getting insurance.. and by looking at the results.. with good reason. First off... All devices break just like apple products do... Why make such a big deal, just take care of your stuff dumb assesssss. yes, all devices break, even dumbasses know that.. but they are not as EASILY BREAKABLE as these apple devices..
And look at the idiots crying about people testing the product build...morons. There is a reason why they do such a thing, in case some people who tend to have butter fingers and drop things, it's better to know if your pricey device will stand up to the abuse that you may unleash upon it. Some people are so stupid(gadget and maier) it boggles the mind. Also the dependability of the product can be brought into question should someone be looking to file suit for building a product that breaks too easily. See there is a brighter side to everything these so called rich people do with their money and be thankful it isn't your money. will it blend as well?? i am wondering if there is any test that drops the device on one edge instead of face down or face up.. since the edge has a smaller surface area hence more pressure.. i know it will break, but i just wanna know the extent of the damage.. but i don't wanna do that with my own device, whether iPad or not.. It's hard to imagine you buy an iPhone unlocked around $600 and when it breaks, either you have an insurance or you are rich to buy another one. Whereas an SG2 which is cheaper than iPhone, survive most crash tests.